Struggling To Set Up Amazon SES? Then Stop! Here's how to do it step-by-step. This guide will save you the headache of trial and error in getting Amazon SES configured. In 12 steps, accompanied by pictures, you'll see exactly how to configure the service. "You?ve done a really great job with this tutorial..."
"What was taking me days of struggling with was done in literally a matter of minutes"
Hi Guys, if you're setting up your own autoresponder and you're struggling to set it up on Amazon SES then I can highly recommend to you Reg Ervin who help me out when I was struggle with setting up my SES. 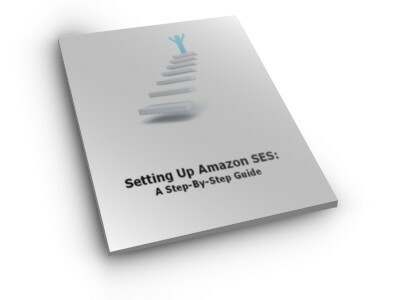 What was taking me days of struggling with was done in literally a matter of minutes by following the guidance in Reg's e-book on the subject called "Setting Up Amazon SES ? A Step-By-Step Guide". Also, Reg is a fantastically helpful guy and he gave me a lot of further support once the SES was set up.